The new imagery, spectacular as it is, doesn't even capture the canyon's full extent. The series of chasms and fractures probably wraps around onto the backside of Charon, which New Horizons could not see during the close approach, NASA officials said. "It looks like the entire crust of Charon has been split open," John Spencer, of the Southwest Research Institute in Boulder, Colorado, said in a statement today (Oct. 1). "In respect to its size relative to Charon, this feature is much like the vast Valles Marineris canyon system on Mars," added Spencer, who is the deputy leader for New Horizon's geology, geophysics and imaging (GGI) team. Charon is the largest of Pluto's five moons. At 750 miles (1,207 km) in diameter, Charon is about half as wide as Pluto itself. The two objects share a common center of gravity, so most researchers regard Pluto-Charon as a binary system. 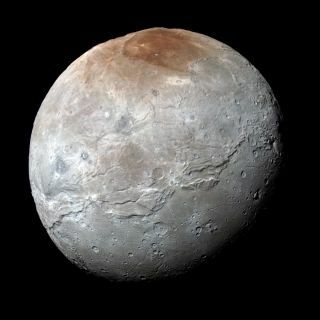 NASA's New Horizons spacecraft used its the Long Range Reconnaissance Imager (LORRI to obtain high-resolution images of Charon on July 14, 2015, which were combined with enhanced color from the Ralph/Multispectral Visual Imaging Camera (MVIC). New Horizons' flyby revealed Charon to be a surprisingly complex and varied world, complete with canyons, mountains, landslides and many other surface features. "We thought the probability of seeing such interesting features on this satellite of a world at the far edge of our solar system was low, but I couldn't be more delighted with what we see!" Ross Beyer, an affiliate of the GGI team from the SETI (Search for Extraterrestrial Intelligence) Institute and NASA's Ames Research Center in Mountain View, California, said in the same statement. New Horizons also discovered that on parts of Charon there are only a few craters, meaning the landscape has been resurfaced relatively recently. Mission scientists said they think water-blasting "cryovolcanoes" may be responsible. "The team is discussing the possibility that an internal water ocean could have frozen long ago, and the resulting volume change could have led to Charon cracking open, allowing water-based lavas to reach the surface at that time," said New Horizons team member Paul Schenk, of the Lunar and Planetary Institute in Houston. New Horizons beamed just a small fraction of its flyby data home on July 14, storing the vast majority for later transmission. That data dump began in earnest last month and will continue through the end of 2016, mission team members said. Mission scientists received the new Charon images on Sept. 21, and they were published today. New Horizons is currently about 3.1 billion miles (5 billion km) away from Earth and speeding farther into the Kuiper Belt, the ring of icy bodies beyond Neptune's orbit. Mission scientists will soon start positioning the probe to perform a flyby of a small Kuiper Belt object, which would occur in early 2019 if NASA approves an extended mission.